I've been very delinquent in blogging lately but I have a good reason why. It's because Paul and I went on a much-awaited trip to Tokyo, Japan with a brief stopover in Manila. We've been planning this trip since last year and despite that, I still had to cram our itinerary a week before we flew off since I had to deal with moving flats sometime in between! Oh dear life. Anyway, all's good and I'm so happy we made the most of our first-ever visit to Tokyo and believe me, this is definitely the first of many returns! 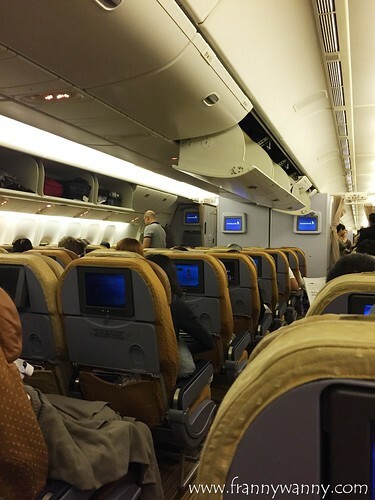 We took the red-eye flight to Tokyo via Singapore Airlines because Paul has work on Saturdays. 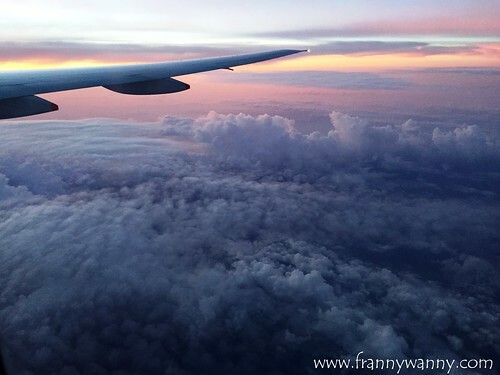 Since we're flying out Singapore at 11:55PM, this gave us ample of time to do all our household chores, run last minute errands, do last minute packing, shower and slowly made our way to Changi Airport. We even had time to grab a bite at the lounge too! Thankfully, SQ always has a nice library of movies, TV series, music albums, games and more. Our flight took approximately 7 hours and since it was a red-eye flight, we were all given our own personal care kits. I love it! I got to admit, the contents were pretty basic (socks, eye mask and toothbrush/toothpaste) but I have this OC habit of making sure that I brush my teeth before sleeping so that was the first thing I did right after eating my in-flight snack. 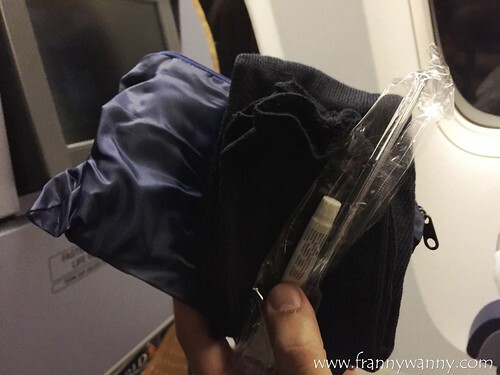 How I wish they'd add a small bottle of hand cream or lotion in the kit as long haul flights can dry your skin. 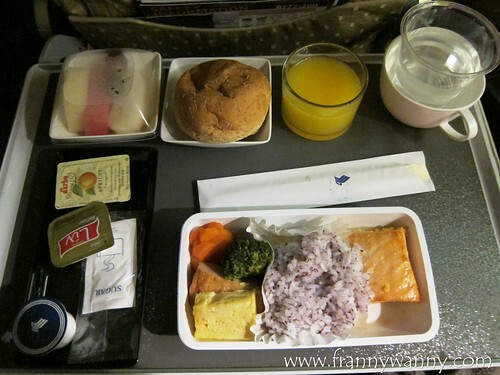 For a 7 hour flight, Singapore Airlines (SQ) did two meal services. First was right after take-off and when the seat belt sign was turned off, they gave our some refreshments. There's the signature packet of garlic peanuts that I love as well as your choice of Warm Mango and Shrimp in Herb Panini Sandwich or Warm Shiitake Mushroom Wrap. Paul instantly dozed off even before the plane took off so I had to set his snack aside. As for me, I went with the Warm Shiitake Mushroom Wrap which was pretty predictable, eh? I have to say that this isn't the first time I've been served a wrap on-board but this is the best. I love the earthy flavor of the mushroom and the wrap was served soft and warm. It was really yummy and surprisingly quite filling too. In a way though, I wish I set it aside too as I was getting ready to sleep and a full tummy won't really be of much help. After serving us our refreshments and collecting the trash, it was lights off for about 3-4 hours. 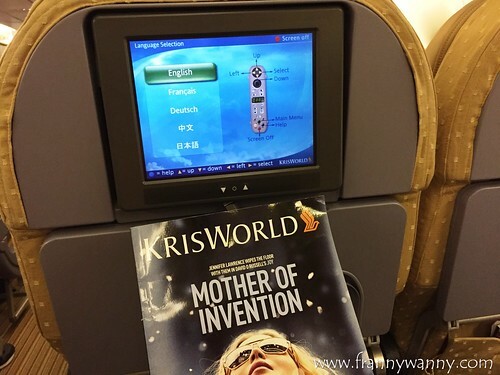 This allowed passengers to sleep or in my case, to watch a movie and a couple of TV series episodes back-to-back. I finally fell asleep after that but was immediately awakened when they turned on the light. I think I slept for only an hour. Drat! It was time for breakfast and my hubby was still sleeping so soundly beside me. Truly ho mia (lucky) as my Mom and Amah would say. The two breakfast sets are pretty much similar to one another except for the main dishes. One is a Japanese breakfast consisting of Grilled salmon fillet in saikyo miso with Japanese omelette served with veggies, sticky Japanese rice with yukari while the other is a western fare of Scrambled Egg with Chicken Sausage and Roasted Tomato, Button Mushrooms and Parmentier Potatoes. Both Paul and I got the Japanese breakfast since we realized that this a unique offering only for flight heading to and coming from Japan. One bite and I knew I made the right choice. The salmon was very juicy, sweet and tender. It's amazing! 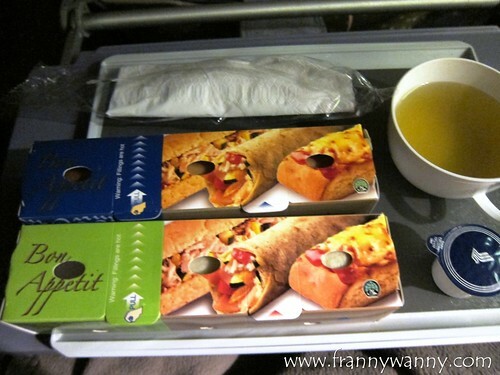 For a minute there, I forgot that this was an in-flight meal that was re-heated in the oven and not served fresh from the kitchen. Nonetheless, the quality and the flavor were the best and the glutinous Japanese rice was just the perfect pair for it. Our meal also came with a slice of tamagoyaki and pink fish cake which I initially thought looked a bit weird. To complete the set, we had fresh fruits, bread roll with butter and our choice of coffee or Japanese green tea. One way to tell if you had a good flight is when you arrive in your destination feeling refreshed and not haggard at all. Well, we've managed to start our tour around Tokyo without finding the need to nap so I guess it's a clear indication that we indeed had a good 7 hour flight and that's thanks to Singapore Airlines. Look at the view that greeted us as the plane slowly made its descend down to Narita Airport. Isn't it breathtakingly beautiful? Hello Tokyo!